Architect designed waterfront house with lovely sea views. Warm sunny decks on three sides with most rooms opening out onto the decks. Sit back and enjoy a cool drink or a glass of wine from one of our local vineyards! There is a garage with internal entry on the ground floor. The next level has the kitchen and dining room, opening out onto a deck with all day sun. The main level has a spacious living room, master bedroom with queen bed, second bedroom with twin beds, bathroom with shower over bath, separate toilet and laundry. Both bedrooms and the living room open out onto sunny decks with sea views. There is a mezzanine level up from the living area with a futon bed. We are in a quiet and peaceful position but only 10 mins drive to local shops, supermarket, cafes and vineyards and a further 10 mins to Oneroa. Close to golf club, tennis courts and Whakanewha Regional Park, excellent kayaking and fishing or just relax and enjoy the beautiful surroundings. Three kayaks and a dinghy are available to explore the lovely bays. We also provide two bikes and even a table tennis table! We have a deepwater mooring available for use. Maximum 6 people. Two night minimum stay. Seven night minimum stay Christmas holiday period. Three night minimum holiday weekends. Easter at high season rates. Three night minimum stay low season. 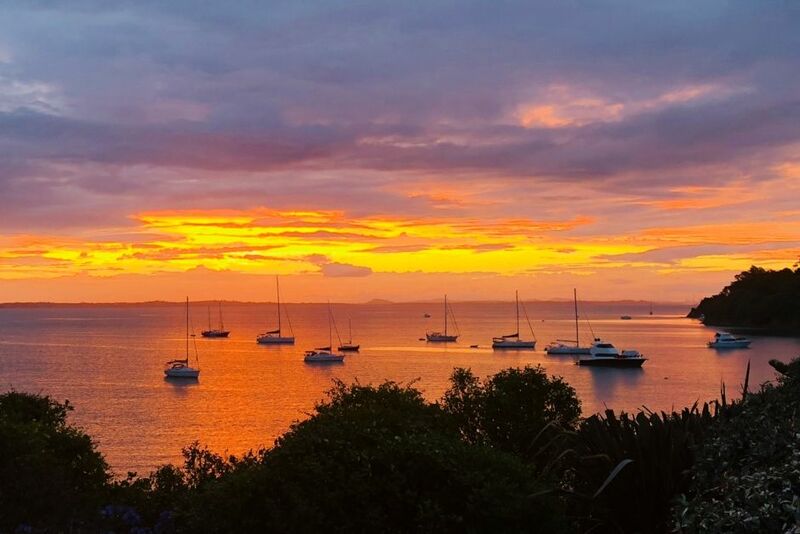 We think we are very fortunate to have a home on Waiheke Island, and Rocky Bay in particular. We are in the centre of the island and close to everything. Swimming is good from our beach but it is rocky, or you can drive 7 or 8 minutes to stunning Onetangi beach. There are many beautiful walks from our property and the bird life in our garden is prolific! If you are a keen fisherman, take out the dinghy or fishing kayak (byo rods) and catch snapper for dinner! House is lovely very clean and comfortable. Thank you for the use of the kayaks. Beautiful place, clean and tidy has everything you need and more , fantastic views would love to come back , would definitely recommend to others . Many thanks . Lovely home, well appointed and in a great location. We will be back for sure! Lovely bach, beautiful views. Spacious, tidy and clean property. All bedding was comfortable. Would highly recommend. This is the second January we have stayed at The Barn. This is the second January we have stayed at The Barn. It’s very well equipped and comfortable and suited us perfectly. Thank you.